ARTBA’s Mike Sakata (left) with Stephen Skippen, Facchina. 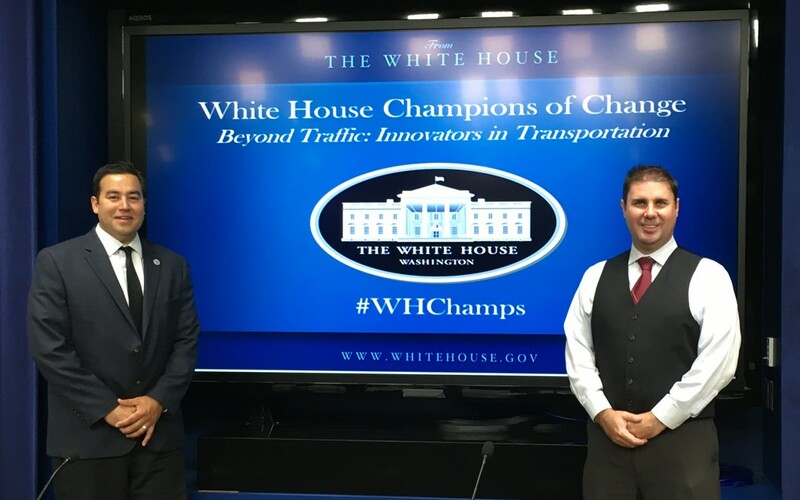 Stephen Skippen, representing member company Facchina from La Plata, Maryland, joined ARTBA’s Vice President of Operations Mike Sakata at the White House Oct. 13 as guests for the “White House Transportation Champions of Change” event. The event honors individuals from across the country for their exemplary leadership and innovation in transportation, chosen by the White House and U.S. Transportation Secretary Anthony Foxx. Eleven individuals were nominated for their “exceptional vision and foresight when it comes to the issues we are dealing with in transportation,” Secretary Foxx said in a press release on the event. This year’s theme, Beyond Traffic: Innovators in Transportation for the Future, helped showcase exceptional service and leadership for our country’s future transportation needs. Honorees included the bicycle-pedestrian program manager for the city of Memphis, Tennessee, a research scientist from the University of Michigan Transportation Research Institute, the CEO of the Jacksonville, Florida Transit Authority and a professor of pediatrics at the James Whitcomb Riley Hospital for Children at Indiana University, among others.